In 1994 the necropolis of Byrsa was discovered by chance on the southern flank of Bursa hill when a man planting trees fell into a grave. In ancient times Byrsa was the walled citadel above the harbour of ancient Carthage and was also the name of the hill itself. 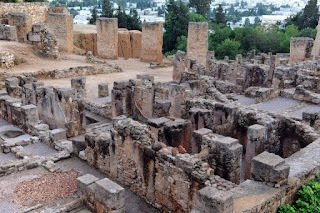 The word is derived from the Phoenician word for citadel and the area was the major military installation of the city of Carthage. Byrsa was besieged by the Roman general Scipio Aemilianus ‘Africanus’ in the Third Punic War and eventually destroyed by Rome in146 BC. Under the direction of Jean-Paul Morel and his team the excavation brought to light from a depth of five metres below the modern surface the skeleton of a young man aged between 19 and 24 years old. The skeleton (below right) was more than 2,500 years old, thus the young man died sometime in the 6th century BC. ﻿﻿﻿ The Tunisian Ministry of Culture allowed the transfer of the young man’s remains to France for scientific examination and reconstruction, and Elisabeth Daynès, a sculptor who specialises in hyper-realistic reconstructions was commissioned to restore the young man to a semblance of his living self. Daynès is an expert in dermoplastic reconstruction, a scientific technique that enables the restoration of the features of an individual with 95 percent accuracy. Some aspects of these reconstructions remain partially subjective however, such as the colour of the eyes and the hair. 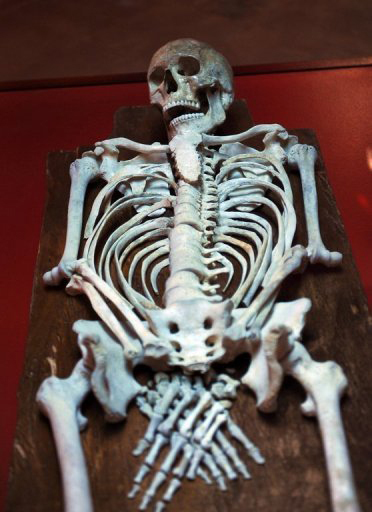 An anthropological study of the skeleton showed that the man had a pretty robust physique and was 1.7 metres (five feet six inches) tall. The cause of his death is not known. He was buried with gems, scarabs, amulets and other items, and therefore may have belonged to the Carthaginian elite. The young man, whose actual name is not known, was given the name Ariche, meaning ‘the desired man’ by Minister of Culture Abderraouf Basti, and was repatriated to Tunisia on September 24 to appear in an exhibition at Byrsa alongside the objects found in his tomb. Ariche is dressed in a white linen tunic, sandals in the ancient Carthaginian style, and a pendant and beads like those found with his skeleton. He will be on show at Byrsa until the end of March 2011 when he will travel to Lebanon, the land of the Phoenicians who founded Carthage, for an exhibition at the American University of Beirut. In the meantime, he is proving a popular attraction for Tunisians, providing them with a visible link to their Carthaginian roots. What an amazing piece of reconstruction work! This was a pretty incredible find and archaeology has come a long way to be able to sequence the entire genome from the DNA extracted from about 250 mg of rib bone. I only saw referred modern Portuguese population not Basque. It makes sense. Ancient iberians from the Portuguese territory had close relations with Phoenicians. They founded Lisbon. Are there any more sources on this archeological site? Does anybody know How did they determine hair texture , style , nose and skin tone for this reconstruction?